This entry was posted in aspirations, dancing. Bookmark the permalink. I always wondered what kind of marketing went in to attracting people to this line of work. Take for example the person who has stood on the corner here in TX all summer dressed as a twin size mattress. Now that had to be some flyer! This is the JOB I have been looking for!!!! My life is about to change dramatically! Wow–you could do this full-time. It’s more like a career than a job. I want to know what the perks are. You’ve got to learn to twirl that sign though! When we went to San Diego the guys standing out there were more like acrobats than sign holders. They were twirlin and flippin those signs all over the place. It was very entertaining! Kay, at first I thought the guys changing the oil were doing the dancing and waving. I was going to wait in line to see you do that! Its just like the hotdog guy that dances around on the corner. He literally dances all day long, Same shoes, morning and afternoon. I find it a little disturbing that he dances so abnormally fast. If ever there was a jiffy jammer, it’s you sister. Get down with your bad groove thingee and rock off and that kind of thing. Do they let you wear a mask? Cause I would do it if no once could identify me. I always pity the poor freaks who actually have this kind of job, but secretly wish I weren’t so inhibited. I have no idea what they must pay the people who do this in Vegas, all summer long, in the 115 degree heat. I can’t imagine anything more miserable. No way! I wonder if they have that in our area, I have some boys who will do anything for money, just read my blog, they’ll even eat poop for the right amount. You know, I’ve been contemplating a change in career of late. With this, I could earn a living and workout at the same time. Count me in. Hmmm…I’ve wondered how they get people to do that job. Now I know! I previously thought that they just approached the pan handlers since they are just standing on the corner anyway – maybe that’s just in our area. Do you suppose you could clog? I always thought that was one of your “outstanding” skills. Now you can do it while standing out and be standing out oustanding. WOW! As a person still young enough to be embarrassed and affected by their mother, I’m always afraid that my mom will find something like this and actually apply…For the sake of your children, don’t do it. 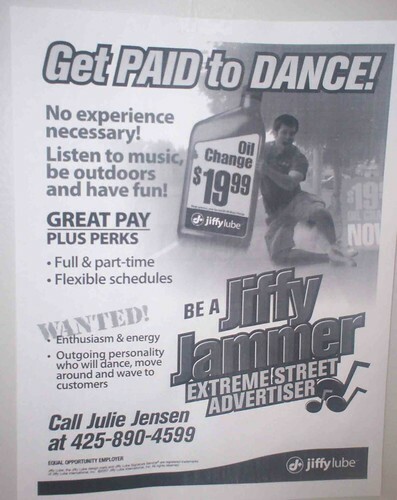 I think this would be a perfect job for Laylee… All that energy could at least contribute to the household expense of peanut butter and jelly! We have a sign waver around town that sets up a boom box and totally gets down! I love it. She makes everyone happy that crosses that intersection. We have a sign waver around town that sets up a boom box and totally gets down! I love it. She makes everyone happy that crosses that intersection, or not – but those others are just grumpy anyway! I love, love, love these dancers on the street corners. I’m so glad there are people out there with iPods who are more than willing to dance their sweet rears off for me while I wait at an otherwise boring red light. They get trixy with the signs sometimes and do all kinds of intricate throws and spins. It’s a real art! Do you at least get to hide inside an enormous, ridiculous costume?? I bet Laylee and Magoo could join you- then you could really rake in the bucks. i know those kids have dance talent inherited from their fab bootie-shaking mom. I would love to see you on the corner shakin’ that thing! I read this post a few days ago, and then yesterday when I was driving all around town, trying to find very picky teenagers some 1/2-way decent jeans…. I actually saw a guy standing in front of Jiffy-Lube when I was waiting at a red light. I actually waited for him to dance. I held up an entire line of cars –honking at me, in case he was about to start dancing–lest he was taking a break. Alas, he wasn’t the dancing guy, afterall.